Our home held an older persons services information drop in afternoon in which we invited in local organisations and support groups to discuss services available to older people in the area and opened the event to members of the public. 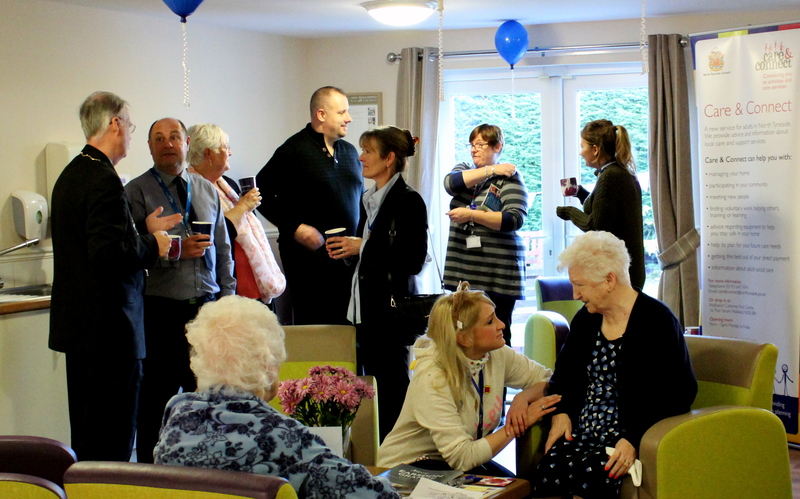 We held the event in our home to provide a relaxed, comfortable space for people to come in and seek advice. Representatives from the Alzheimer’s Society, Age UK, Care and Connect North Tyneside, Equal Arts, and the North Tyneside Carers Centre met with guests to discuss their services and the help, advice and support available in the area. Why did you decide to hold the event? We thought that this would be a great way to connect with organisations relevant to our residents and their families and friends, as well as provide the opportunity to showcase the works of Older Persons advice, support and social groups in the area and help inform local people of the resources and support available and equip them with the knowledge of where to go for help and further information. The open day also offered a networking opportunity for local older persons groups, as well as older people living in the area. What was the impact on the professionals/residents and staff? Following the event we received an email with some lovely comments about the event and the home from the Chairman of North Tyneside. The staff were very proud. We also had some new visitors from a neighbouring sheltered accommodation complex who said they’d like to come along to our weekly coffee morning and future events which is great for our residents who like to make new friends. What have you learnt about the power of community engagement? As care homes we often think about how getting involved in the community can benefit our residents and our home but we also have so much to offer our communities too. As part of day-to-day life we form many close relationships and networks in our area, from our visiting healthcare professionals, to local suppliers, to our local authority, to community groups and churches involved in our activity provision. We can use our connections and shared knowledge to help benefit people living locally and better our communities as a whole. Thank you to Joanne Rossiter, Maria Mallaband & Countrywide Care Homes.